I’m delighted to be joined by therapeutic harpist, Amir Seifouri, for this Spring Restorative Yoga Sound Bath. This deeply healing evening will be invite a deep Spring cleansing of the emotional and mental aspects of our beings. Relax in nourishing, cleansing restorative yoga poses designed especially for Spring while singing bowls, tuning forks, and other overtone emitting instruments harmonize your subtle body in a powerfully transformative sound healing experience. Cultivate inner listening and insight through chanting and sound meditation. Unwind, rest, and restore your being. Associated with the Wood element in Chinese Medicine, Spring heralds an opportunity for change and expansion. This season awakens in us the desire in every cell of our body to cleanse itself of the old, and make space for all the new things to blossom into full manifestation. Sometimes, however, the rising energy of Spring feels more like a craggy lurch. Change can be difficult, as we tend to bump into our habitual resistances on the path. In Springtime, we often physically experience these toxins running awry from our congested livers which get overloaded from rich, heavy Winter foods, stimulants, and our busy stressful lives. As in night which is the sacred time when our bodies and minds do their detoxification and renewal processes, Spring is when our liver is the most active and therefore our bodies need deep nourishing, restful practices in order to cleanse, replenish. Amir Seifouri is a Therapeutic Harp Practitioner trained by International Harp Therapy Program. 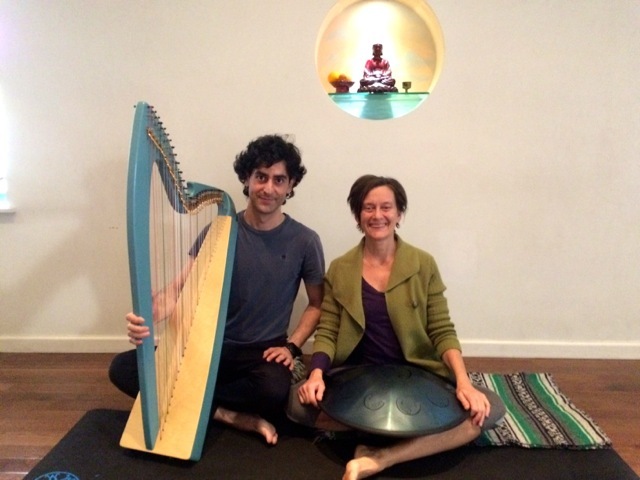 By applying his skills in the ancient art of Harp Therapy, he creates a magical, therapeutic, and exceptional yoga experience for his clients and his students. While being in Yin and Restorative poses, individuals hearing soothing improvisations in modal music, which have no memory associated with them, find themselves in an introspective and healing states. Harp Therapy helps to reduce pain and anxiety and promotes healing. Amir completed his 200-hour YTT under the guidance of Adriane Bruke, Jill Camera, Joe Miller, and Samantha Debicki, and his Yin and Restorative YTT with Masako Miyakawa at Sacred Sound studio in 2018. Leigh Evans, yoga teacher and sound artist, is a go-to resource for Ayurveda Yoga and seasonal attunement practices which harmonizes our inner rhythms with the energetic movements of each season. They are a holistic approach to asana practice, diet, and lifestyle which nurtures out interconnectedness with nature. Each Seasonal Yoga Practice is attuned to particular elements of each season in accordance with the Chinese Five Element Theory, meridian, and seasonal dosha in accordance with the Principles of Ayurveda. Leigh teaches festivals, teacher trainings, retreats, and workshops nationally and internationally.